Measures of consumer confidence continue to report mixed results on a monthly basis. 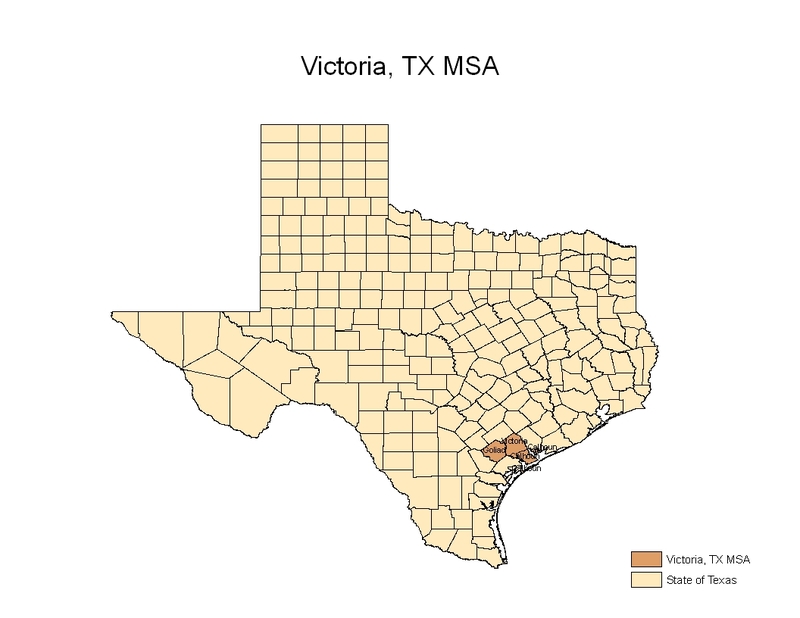 However, over time they are trending in the same direction. 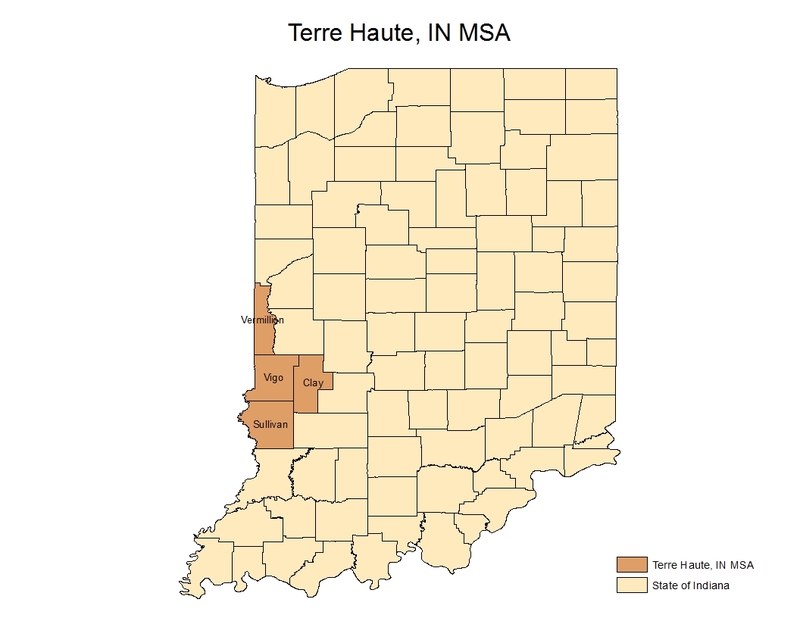 According to Thomson Reuters and the University of Michigan, the Consumer Sentiment Index rose by 1 point in July to a seasonally adjusted level of 84.1. The final reading of consumer sentiment was revised up from the preliminary reading of 83.9 that was released earlier in the month. Meanwhile, the Conference Board reported that its Consumer Confidence Index fell by 1.8 points, 2.2%, on a month-over-month seasonally adjusted basis in July to 80.3. 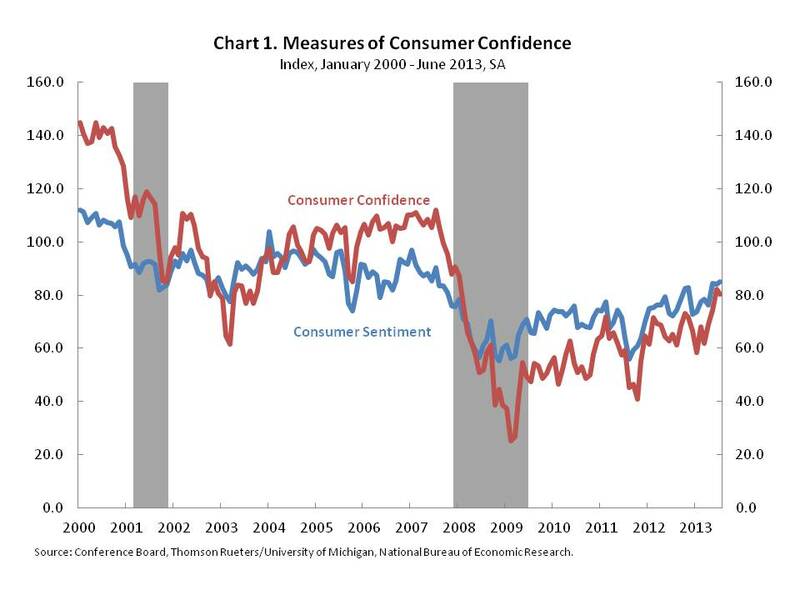 The directionally opposite monthly movements recorded by the two measures of consumer confidence in the month of July reflect different conclusions about consumers’ expectations about future conditions. According to the University of Michigan’s Consumer Sentiment Survey, the 5 point increase in consumers’ assessment of current conditions, from an index level of 94 to an index level of 99, was only partially offset by the 1 point decline, 78 to 77, in their view of expected conditions. In contrast, the decline in consumers’ expectations of future conditions according to the Conference Board’s Consumer Confidence Survey, a 6 point drop from an index level of 91 to 85, more than offset the 5 point increase in consumers’ assessment of their present situation. Despite the sharp decline in consumers’ overall expectations as recorded by the Conference Board, the share of consumers planning to buy a home in the next 6 months rose. The rising trend in the share of consumers planning to purchase a home largely reflects an increase in the percent of respondents planning to purchase an already “lived-in” home. The share of consumers planning to buy a home in the next 6 months rose by 0.2 percentage points to 5.7% on a month-to-month seasonally adjusted basis. Since January 2011, the percentage of respondents with house purchasing plans has risen from 2.0% to 5.7%. Over this same period, the share of respondents planning to purchase a “lived-in” home rose by 2.2 percentage points while the share of respondents planning to purchase a new home rose by 0.7 percentage points. 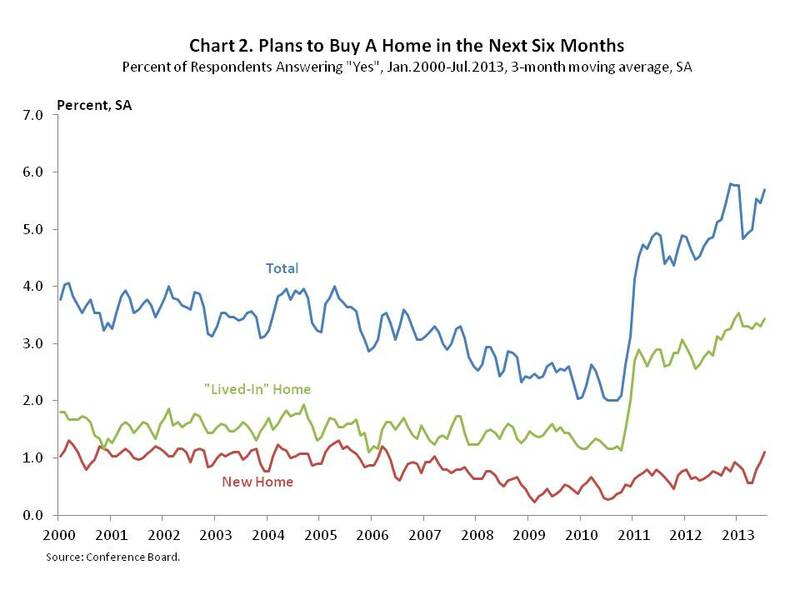 The portion of respondents that plan to purchase a home, but are uncertain about whether it will be a “lived-in” or a new home (series not shown) also rose by 0.7 percentage points. 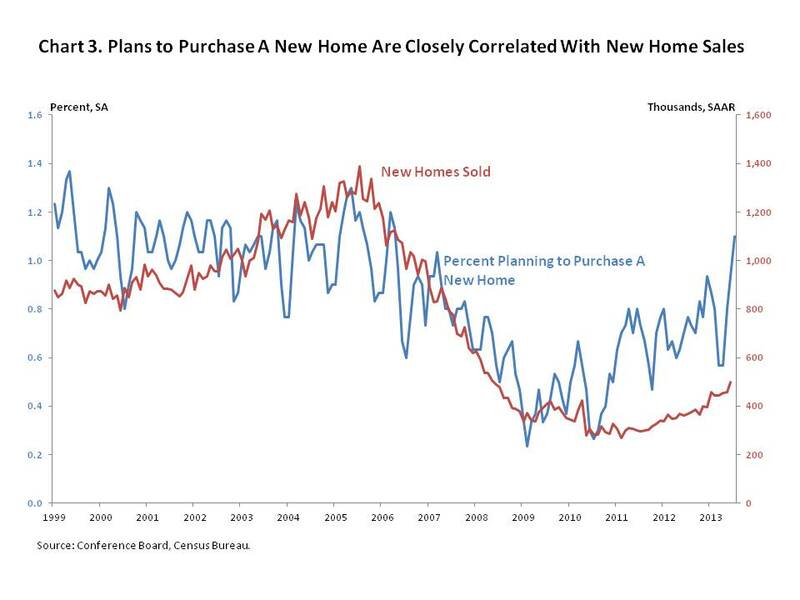 The percent of consumers planning to purchase a new home is closely correlated with new home sales while the share of consumers planning to purchase a “lived-in” home is less correlated with single-family existing home sales. The continued increase in the percent of consumers planning on purchasing a new home as shown in Chart 3 may indicate that new home sales will continue to recover. 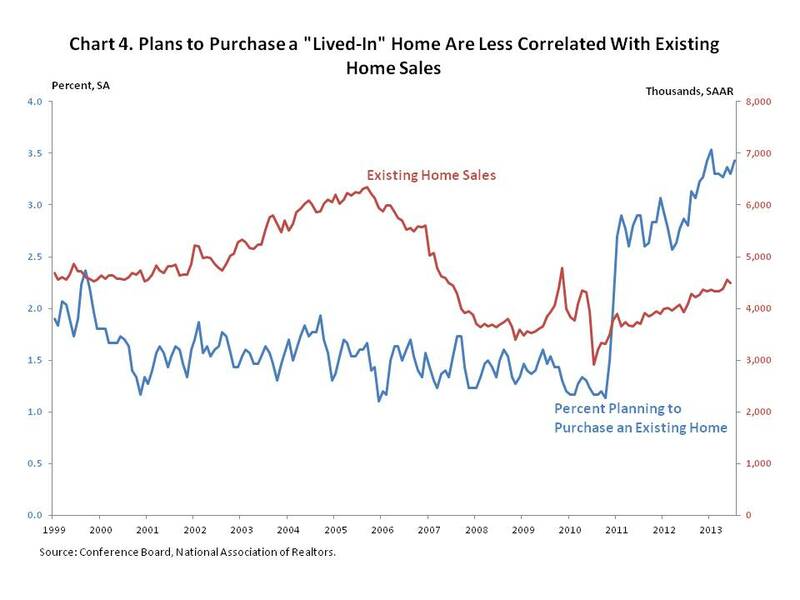 In contrast, the rise in the share of consumers planning to purchase an existing home is not a strong predictor of existing home sales.